MacOS 10.13 High Sierra beta 1, iOS 11 beta 1, watchOS 4 beta 1, and tvOS 11 beta 1 are all available right away to users enrolled in the eligible developer beta testing programs. For iPhone, iPad, and Mac users with developer beta profiles installed on their devices, they will be able to get the beta update for iOS 11 and macOS High Sierra right away through Settings app in iOS and App Store on the Mac. Users can also get the developer beta profile here at developer.apple.com. Always back up a device before installing beta software. The developer beta releases are notoriously buggy and are not recommended for anyone but advanced users to install onto secondary hardware. Anyone can technically purchase a developer license to have access to developer software from Apple, though it is not recommended. Curious users are better off waiting until the public beta is available instead. Where is iOS 11 Public Beta 1, and MacOS High Sierra 10.13 Public Beta 1? 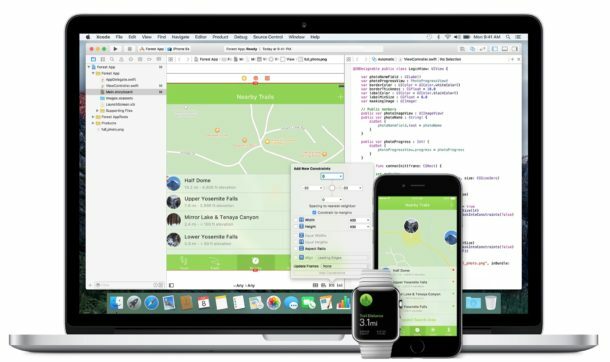 Apple announced the iOS 11 public beta and macOS High Sierra public beta will debut to all interested users later in June. This means you will need a few weeks worth of patience before being able to install those beta updates on your compatible iPhone, iPad, or Mac. Most users are better off avoiding beta releases entirely and instead waiting until the final version of iOS 11 and macOS High Sierra are released in the fall. If you were enrolled to receive beta updates but opted out for betas for iOS or opted out of betas for MacOS, you would need to opt-in again and download the beta profiles again from the Apple Developer Center. sudo /usr/libexec/PlistBuddy -c "clear dict" -c "add :SeedProgram string DeveloperSeed" "$3/Users/Shared/.SeedEnrollment.plist"
sudo defaults write /Library/Preferences/com.apple.SoftwareUpdate CatalogURL "https://swscan.apple.com/content/catalogs/others/index-10.13seed-1.sucatalog"
This is according to a post on MRF. This will mark my exit from Apple iDevices, not only was my less than 3 yr old iPad mini made legacy with iOS10 my perfectly good iPhone 5 is now legacy with this. Indeed. After you switch to Android, you can enjoy a phone with a back level OS and no prospect for an upgrade, ever. Or a max of 3 years of updates if you buy a Google phone, instead of the 5 you got with the iPhone 5. P.S. The iPad Mini is a 5 year old product as well, even if you bought it 3 years ago. The number of idiots who say they are leaving Apple or this site is growing daily. Sadly they won’t change a thing, just like all the idiot actors and actresses who said they were leaving the USA if Trump was elected. He was and they are all still here. Talk is cheap. This isn’t pertaining exactly to this article, but upon reading up more on iOS 11 I do have mixed feelings. Such as I’m kind of happy about it, but I also want to say ‘it’s about damned time’ for some of the features. The Files app specifically. I can’t believe it’s taken this long for iOS to have a default non-third-party file/folder navigation app as well as having a dock (even though it’s a modified control center). As for the complaints of treating older devices as legacy, I try my best to pay attention to the devices and manufacturers that I have encountered since I’ve been working in tech for a small time now and everyone is equally guilty of ‘planned obsolescence’.